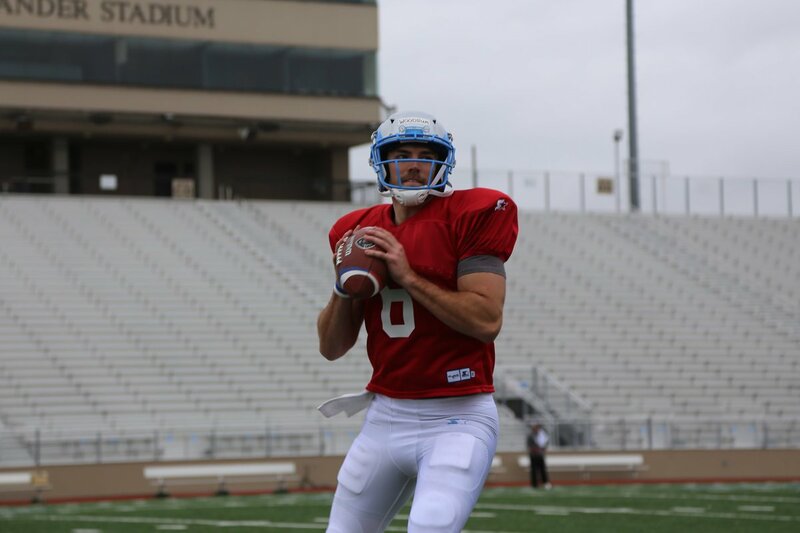 Rick Neuheisel has decided to go with Trevor Knight. Many people believe the Texas A&M standout has an opportunity to be one of the elite players in this league. I think Neuheisel will use some zone read with Knight which also fits the talents of RB Larry Rose out of New Mexico State. I think they will be a high scoring offense but may struggle to stop people. The Stallions went with a little bit of an unknown in Josh Woodrum from Liberty. He did make a few camps in the NFL and I think he will do well in running a more pro style offense. I think the Stallions will play a hard nose style of defense and and try to win low scoring games. I feel like they will not have as much athletic talent as some of the teams. Mike Riley made what I thought was a surprise move when they protected regional QB Dustin Vaughn from West Texas A&M with the fourth pick in the first round. But, Riley is going with his man. Vaughn was a D2 guy but did make the Cowboys roster in 2014. I look for WR Greg Ward Jr. out of Houston to be the go to guy for Vaughn. Mike Martz has been know to throw the ball around a lot. He originally had veteran Joe Johnson listed as his starter but Johnson signed on with the Redskins after their QB injuries so Martz will go with Mike Bercovici from Arizona State. I’m going to say on the defensive side of the ball, Andrew Stelter out of Minnesota, a big DT, is going to also make an impact for the Fleet. Head Coach Kevin Coyle who took over after Brad Childress resigned is still torn between QBs. Both Aaron Murray and Matt Sims are listed as possible starters. Both are very similar, both played in the ACC and got a few looks in the NFL. Mike Vick is the OC and both these QBs are about as far away from what Vick brought to the table as you can get so it will be interesting to see. First time head coach Tim Lewis must be a believer in Luis Perez. Perez never played varsity football (his early years he as a TE in a wing T offense). He walked on at Southwest Community College then went to Texas A&M Commerce and led them to a National Title and was named the D2 player of the year. 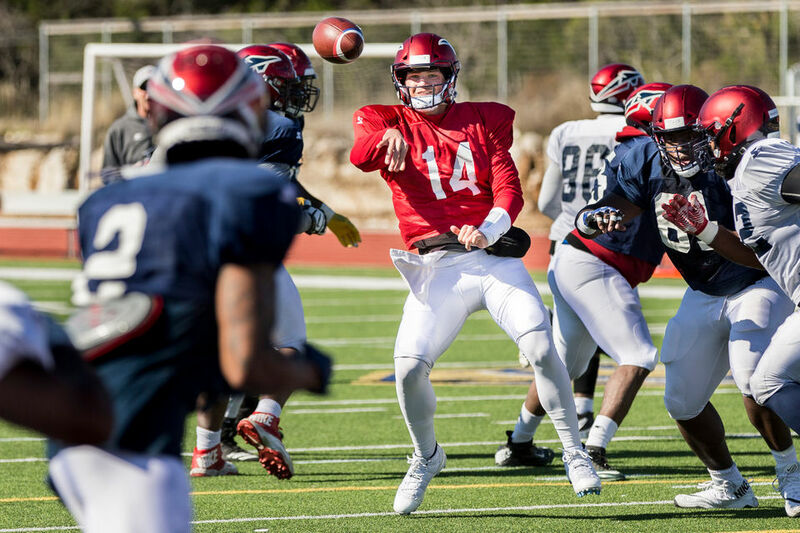 Lewis, with the fifth pick of the AAF QB draft, grabbed Perez off the Commanders roster. The first team to not just protect one of their own QBS. Perez beat out the favorite, Blake Sims from Alabama. Mike Singletary sits in a unique position with his QBs. Right now he lists both Zach Mettenberger and Christian Hackenberg as starters. Mettenberger had off the field issues in college and by many is seen as an underachiever. Hackenberg was a second round pick out of Penn State that has also been an underachiever. It will be interesting to see how they both mesh. I like the talent all over the Express roster and feel like they might be a favorite to come out of the east, but both these guys probably think they should be in the NFL so I’m not sure either will have their heart and soul into this league. The old ball coach has left it wide open. He lists all his QBs as possible starters. Spurrier just might use all three. I’m going to go with Kevin Anderson from Fordham to rise out of the group and be the Apollos starter. He has almost every passing record at Fordham. Spurrier has surround his QBs with a bunch of fast receivers, including Donteea Dye Jr. out of Heidelberg University. Don’t know a lot about Josh Woodrum. But if you have a sweet mustache and are a Stallion, I’m all in. BTW Georgia and Tennessee are SEC. Got to talk to the editors, how did the ACC instead of SEC make it through. Thanks for reading, Woodrum is going to be good. We are the only site to keep statistical leaders week to week for the AAF. Let everyone know.